The MESDI Magyarország Kft. was founded in the spring of 2006 to introduce and spread in our country a new cleaning technology, the license-protected product of the American Dust-Tex company. Today the MESDI Magyarország works as a branch of business of the SanOdor Kft. We offer our partners such a service (so far unknown on the Hungarian market), which was introduced in the USA for the first time almost 60 years ago and it is successfully marketed ever since, not only in the USA and Canada, but also in Central and South America, as well as in several member states of the European Union. The formation of this special cleaning technology was performed by gathering the experiences of several decades. 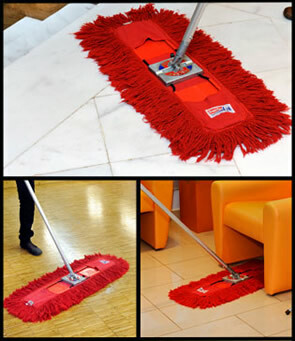 When developing the replaceable mop heads, emphasis was laid on the following: the mop should contact the floor over as wide a surface as possible and need minimal physical effort for this. The head of the mop is made of 100% cotton fibers, and it contains no synthetic fibers. They are sewn by using five different length cotton fibers, so these collect and keep and all the dust and dirt in themselves. Due to the special impregnation, in the course of their use, they will keep their cleaning and disinfectant effect for sure.